At the beginning of this school year, the Servant Sisters of the community of Lumezzane wanted to give the 11-16 year old girls an opportunity to grow humanly and spiritually. We began some weekly encounters which we named "IMAGE". This name is to remind us that we are created in the image of God and that the model of a woman for us, the person whom we want to imitate, is Our Mother Mary. One of the things that was needed most in this group of young girls was to learn to serve and to be aware of the needs of others and not only of their own. That is why we decided to prepare something to share with others: an English dinner prepared and served by the girls themselves, for their families. The dinner took place on Sunday, December 22nd. More than 50 people came, who were all families of the girls. 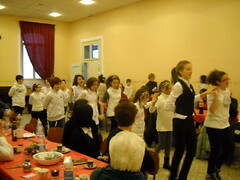 Once all the families had arrived and were seated at the tables, the girls entered the dining room all dressed alike, doing their English dance. 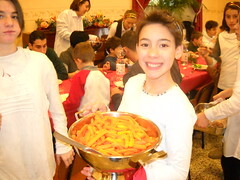 After the dance, the girls served the dinner. They had also helped to cook, set the table, etc. It was all delicious, even the Yorkshire pudding, which was a new taste, with an interesting texture for what they were accustomed to. After dinner, the sisters prepared a game to have with the families, with challenges and a trivial about the theme of Advent and Christmas. Later, we sang Christmas songs in Spanish and Italian. In the end, it was an international encounter. The girls' families were very happy with the experience and wanted to have another one again some day. We hope to keep helping our youth to be an image of the Virgin Mary more and more.